With summer around the corner, we expect many of you will crack open a bottle of Lighthouse Lemonade and serve this all-natural drink at picnics, events, and outdoor parties for friends and family. Now available in over 200 locations across Ontario, we are proud to be a local favourite among the community – but we couldn’t have done it without the mentorship from our community behind-the-scenes. The wonderful team at Innovation Guelph have been a huge help in fostering our growth and helping us expand into grocery stores near you (and thank goodness for that goodness!). 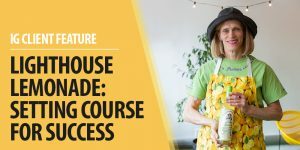 Lighthouse Lemonade’s Founder and CEO, Jill Fisher, spoke with the business acceleration organization on why she turned to Innovation Guelph to help her bring more Lighthouse Lemonade to you! Don’t miss this “zest”-cess story by viewing the feature here. Be sure to follow us on Facebook, Twitter, and Instagram for the latest news and updates. Happy summer sipping!